CME: This issue includes 4 AMA PRA Category 1 Credits™; 4 ACEP Category I credits; 4 AAP Prescribed credits; and 4 AOA Category 2-A or 2-B CME credits. Included as part of the 4 credits, this CME activity is eligible for 0.5 Infectious Disease, 0.5 Pharmacology, and 0.25 Sexual Assault CME credits, subject to your state and institutional approval. CME expires 02/01/2022. 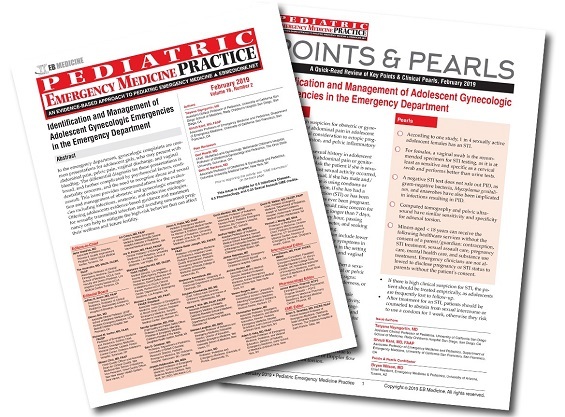 In the emergency department, gynecologic complaints are common presentations for adolescent girls, who may present with abdominal pain, pelvic pain, vaginal discharge, and vaginal bleeding. The differential diagnosis for these presentations is broad, and further complicated by psychosocial factors, confidentiality concerns, and the need to recognize abuse and sexual assault. 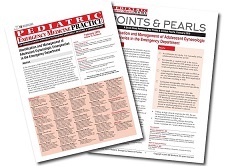 This issue provides recommendations for the evaluation and management of obstetric and gynecologic emergencies including infectious, anatomic, and endocrine etiologies. Offering adolescents evidence-based guidance and treatment for sexually transmitted infection and avoiding unwanted pregnancy can help to mitigate the high-risk behavior that can affect their wellness and future fertility. A 15-year-old girl presents to the ED with vaginal bleeding that has persisted for 1 month. Over the last few days, she has had to change pads every hour. The patient says she feels fatigued and is unable to go to school. Her vital signs are: blood pressure, 110/70 mm Hg; heart rate, 110 beats/min; respiratory rate, 16 breaths/min; and oxygen saturation, 100% on room air. On examination, she appears pale and fatigued. She has a systolic flow murmur with clear lungs, and her abdomen is soft and nontender. What labs should you order? Are imaging studies warranted and, if so, which would be best? Does this patient need a transfusion? Should she be admitted or can she be treated as an outpatient? You are then called to the resuscitation room for a 17-year-old girl who was found unresponsive at home. On examination, she is ill-appearing, lethargic, has cool distal extremities, normal heart sounds, and clear lungs, and her abdomen is soft but tender in the left lower quadrant. Her vital signs are: blood pressure, 80/40 mm Hg; heart rate, 130 beats/min; respiratory rate, 25 breaths/min; and oxygen saturation, 95% on room air. What are the immediate first steps in managing this patient? What testing is needed for evaluation and management? What is the appropriate disposition?